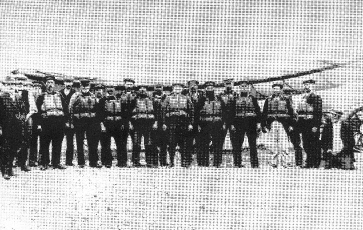 Following a number of wrecks that had occurred off Hayling, and one particular wreck of the schooner ‘Ocean’ when Major Festing led 12 Hayling fishermen to rescue it’s crew, the vicar (Rev. 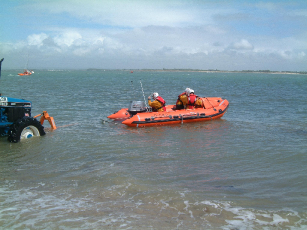 Charles Hardy) brought to the RNLI’s attention that a lifeboat was needed on Hayling Island. On the 13th September the first station was opened and the new self righting lifeboat boat was named Olive Leaf, a gift of Messrs Leaf, Son and Co, of Old Change City of London. 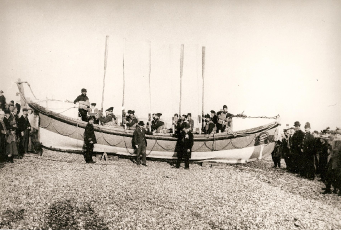 In 1888 a new lifeboat Charlie and Adrian was built for Hayling Island by Hanson & Sons in Cowes to replace the station’s first boat Olive Leaf. 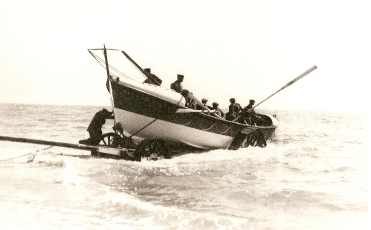 In May 1914 a new lifeboat Proctor arrived at the station. A new boat house had to be built to house the boat. The new station was built adjoining the Coastguard station about 2 mile east of the old lifeboat station. In 1924 Hayling lifeboat station closed, the lifeboat Proctor was sailed to cowes for a refit, then sent to Berwick-on-Tweed. The two old lifeboat stations still stand today, the oldest is the public house Inn On The Beach and the newer of the two is the Army cadet hall behind the current Coastguard station. 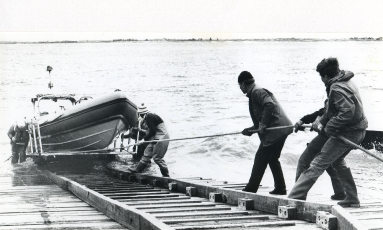 In 1975 Hayling Island lifeboat station reopened due to the increase in inshore incidents in the late 1950’s, such as bathers washed out to sea, children on lilos, dinghies etc. where speed was vital in reaching a casualty before a situation deteriorated. 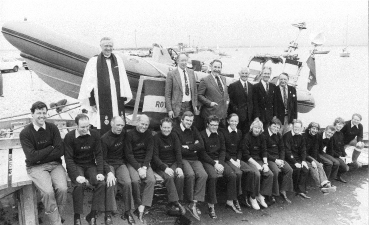 In 1966 Frank Martin and his two sons started a rescue patrol on Hayling, in 1971 Frank formalised this by creating Hayling Island Sea Rescue and Research Organisation (HISRRO). 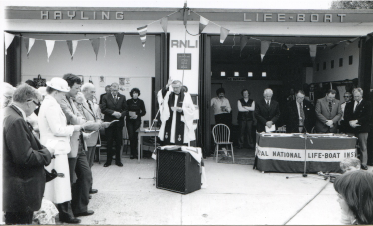 Two years later after proving an inshore lifeboat was needed on Hayling Island, Frank worked with the RNLI and reached an agreement whereby a station would be built for both HISRRO and Hayling RNLI in its current position at Eastoke point by 1975. The RNLI sent an Atlantic 21 B-511 funded by members of the Co-operative Woman’s Guild of Great Britain. In 1995 the Atlantic 21 Aldershot was coming to the end of her operational life, the next generation of Atlantic lifeboat was then allocated to the station. This was an Atlantic 75, paid for by Betty Battle (see below) therefore the new Atlantic 75 B-712 was named Betty Battle. On the 23rd March 1995 a smaller D-Class Victory Wheelers from the RNLI’s relief fleet went on station for trials in the summer season, almost a year later on the 12th March 1996 a new D-Class Leonard Stedman was put on station after trials proved that a D-class was needed at the Hayling Station. To House the two boats now on station and to provide better facilities for the crew a new lifeboat station had to be built. 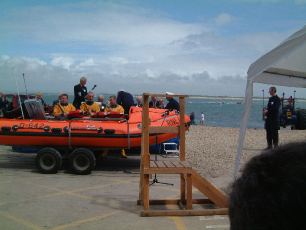 Both the station opening and the Atlantic 75 Betty Battle naming took place on the 19th September 1995 almost 130 years after the first lifeboat on Hayling Island was named Olive Leaf. In may 2005 the station received a new ILB1 lifeboat D-642 Amanda, James and Ben this boat was also paid for by Betty Battle and named after her 3 grandchildren at the time Amanda, James and Ben. 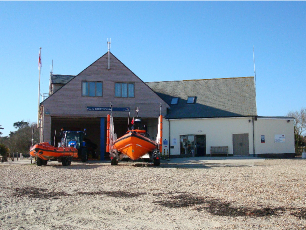 In 2005 plans were made to extend the boathouse to house a new Atlantic 85 lifeboat. 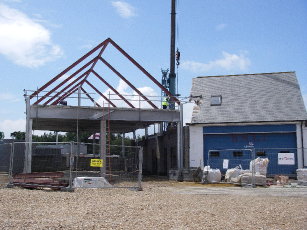 The extension consisted of a new boat hall 19m x 11m, with a larger ops room and crew room upstairs. The old station boathouse was turned into a changing room for the crew and a museum, the upstairs of the old station was turned into a training room. Whilst rebuilding was carrier out the boats and equipment was stored in containers and the crew worked from a portacabin. The new boathouse was funded from legacies of around £500.000 from the Lusty Family and the remaining £300.000 provided by Gwendoline Prince and Mr and Mrs Hudson. On the 1st October 2006 Betty Battle sadly passed away, before this she had arranged the replacement of the Atlantic 75 B-712 Betty Battle with an Atlantic 85 B-829 to be named after her late husband Derrick Battle, to ensure that Betty’s name would be remembered the station has named the County tractor Betty after her. Betty was a chairman at the RNLI’s Ashtead Branch. In 1995 Derrick gave Betty a sum of money to do as she pleased, after speaking to the RNLI it was surgested she funded an Atlantic 75 (the first of the 3 boats she funded). In December 2008 the station received a new D-Class launching tractor, a New Holland TA86. The tractor was named Gwendoline after the late Mrs Gwendoline Prince, whose substantial legacy helped to fund its purchase and a modification for beach working.